Yes, that's right, your boy's dreams of taking down dangerous criminals (or, if we're talking about Cops, shirtless guys with sagging pants) can finally be realized. He'll be writing citations for that neighbor's poor parking or unsightly lawn in no time. And soon enough he'll be flagging down speeding cars, writing tickets and telling them to remain calm or they'll have to step out of the vehicle. It's a good thing you're family, maybe he'll cut you some slack. Then again, we've seen this type before and you know he's a by-the-book officer hoping to make sergeant early in his long and distinguished career. Don't cut any corners, and definitely don't go "five over the speed limit" because he's going to catch it. Too many offenses and you'll be taken downtown for booking. But turn the tables on him! 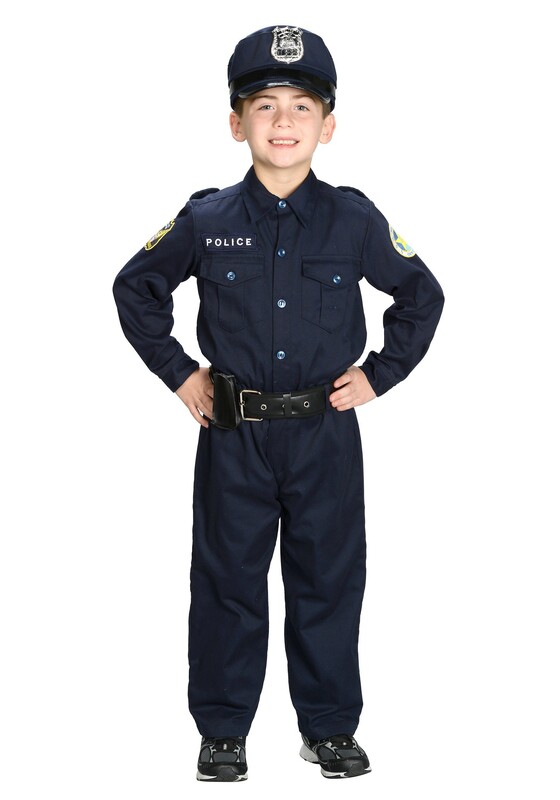 You can get a Police Officer costume and start writing tickets of your own! Time for a room inspection? Not clean enough, that's a ticket. Didn't finish your broccoli? That's a ticket. If he gets too many, threaten to bust him down to cadet or take his badge and gun (Ooooh yeah, they do this all the time in movies and your kid is gonna love it! Or hate it, because you're taking his badge and gun, but then he can be a rogue cop, in pursuit of the most elusive thing of all: justice). But finally you patch things up and together you take down the giant criminal syndicate. This thing goes all the way to the top! The mayor's office even! Truth and justice will prevail! This is one of the most well made costumes I have ever seen. I ordered a size 6 for my grandson, and it fit him perfect. So very pleased with this purchase. I will definitely be ordering from HalloweenCostumes.com again...Thank you so much! Absolutely love this costume. Such a great quality and well worth the cost. My son has literally come home everyday after school and put on his police uniform. It is withstanding running, jumping, 5 year old boot camp basically. I definitely would recommend this product to anyone who asks. Sounds like that little 5 year old has a ton of energy, and the fact that he chooses to wear a costume on a daily basis makes him one of my new favorite people. Tell that kiddo to keep up the good work, and thank you for this review!